This photo is licensed under the Creative Commons Attribution-ShareAlike 3.0 License. Thomson Memorial Park is located in near Lawrence Ave and Brimley Rd in Scarborough. The Scarborough Historical Museum is located within the park and it also includes historical houses that belonged to the Thomson's who were the founding family of the former city, dating from the 1790s. 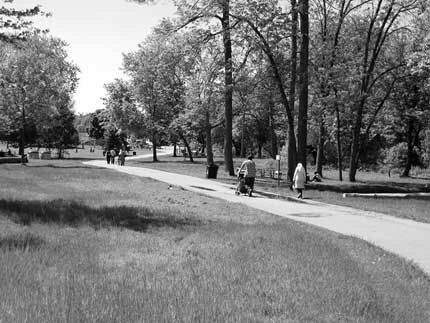 "On three separate occasions I have experienced something at Thomson park. There is a historic museum at this park if you have gone you'd see it theres a log house, a white house and another building. Back in 2006 I went to the park with a friend of mine at night and jokingly said " lets go walk around and see what happens" So we walked into the gate and hit the middle of the grass I got this weird feeling that someone was standing in the white house watching us. I couldn't really breath so I told my friend I was with that we shouldn't be here so we quickly ran out of the gate. Walking along the path I looked up to one of the windows that faced the parking lot, and the light in there was on. Soon as I pointed it out to her the light switched off.. My friend was creeped out to the max as I was scared as well. Reminding her it is an old house it would do things like that and there could be cleaners in there and would explain that feeling. Something told me it wasn't just the wiring... and what would a cleaner be doing in an old house at 9:30 pm? and not have ALL the lights on..? Photo submitted to us by witness. 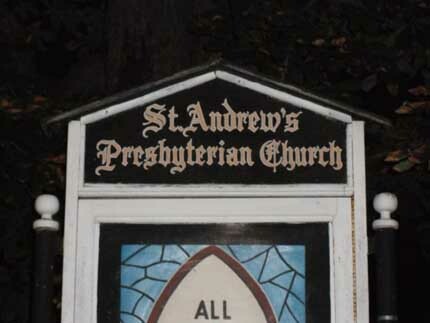 In March 2009 I was at St Andrews church. its Right beside Thomson park when you walk along the path and its on the same street as David Thomsons brother's house. This is one of the first Churchs in the Bendale community and it has a little cemetery. My friend and I love going there both for different reasons. I'm more then fascinated with David and Mary Thomson as they did a lot for Scarborough and a lot for the community I live in. My Friends step grandfather was buried there so two great reason to pay respect to 2 heros in my eyes and a hero in hers. We were there one night just visiting her step grandfather when I got the feeling someone was watching us. I heard something near the back of the cemetery what sounded like two very big stomps and a door closing. Mind you there is a little shack at the back of the cemetery. we both walked out of the cemetery and walked towards that house to see if someone went in. No lights were on and looked like no one was in there. Walking back towards the Church we heard a door shut and walking down stairs.. from where I was I could see the door to that house and yes there are houses around there, but are too far off for it to sound that close.. I looked back and no one was there but the door was open. so That meant someone was in that cemetery. To scared to find out we ran down the street. In May 2009 my boyfriend and I were at Thomson park at night and were just walking around we passed the old log house. I noticed at the corner of my eye that someone was in there wearing white. I knew it was neither one of us seeing as he was wearing black and I was wearing purple. So I stopped walked back a few steps while he continued to the car. No one was there when I went back. I walked a little closer to the window to see if it was just my imagination. I noticed that the rocking chair was moving as if someone just got off of it or someone pushed it."